This is a really cute necklace for little girls. I used the latest shopkin craze Pendant, she is Minnie Mentie inspired by Shopkins. 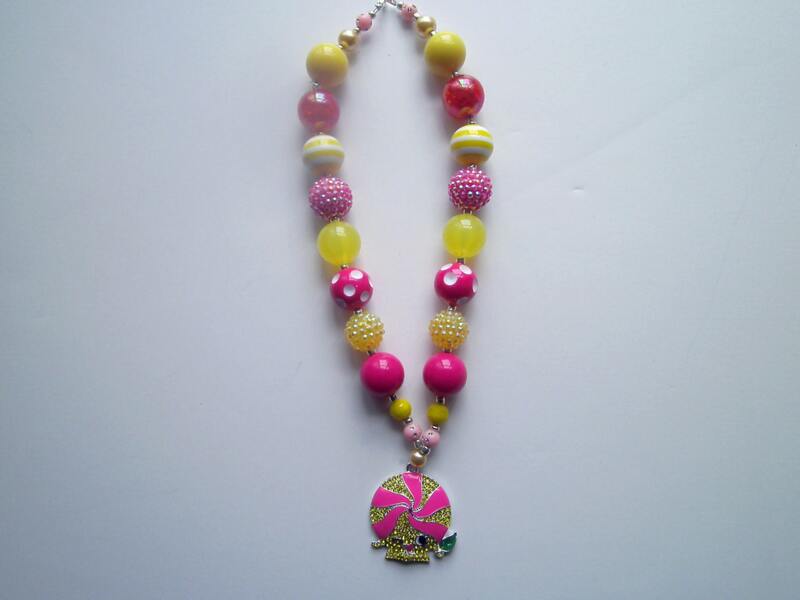 The necklace has a combination of shinny rhinestone, resin, acrylic bubblegum beads and a rhinestone pendant. They are all strung with beading wire and a clasp. The necklace hangs 18" not including pendant. This would make a great gift for any occasion.or can be used for photo prop. Necklace would be a great accessory for any outfit. Your little girl will love it. Each necklace is Handcrafted so you always get a one of a kind. Disclamer: Necklace contains small parts and small children should always be supervised when wearing itis not a toy!